Saukok Tiampo, regular contributor to REVEL, shares the latest light and bright palette of wedding details, just in time for summer nuptials. Inspired by playful florals and refreshing fruit details, this Preppy Lemon + Green wedding palette is perfect for the hot summer months! Your bridesmaids will thank you for their romantic chiffon gowns in sunny yellow hues, complimented by fresh greenery and seersucker details for an extra dose of preppy goodness. For more details on this Preppy Lemon + Green wedding inspiration, head on over to REVEL! Anything gold and shimmering in wedding decor instantly takes your ceremony and reception space up a notch, and we think we just might have found the perfect pairing! Turquoise and gold together makes us think of luxury and summer, with just a bit of cozy and vintage tied in. Have you ever browsed through your grandparents’ wedding album for inspiration? Look beyond the dated photos and you’ll see this charming duo (the colors and the couple!) in not only the decor, but the bridal and bridal party fashion, as well. Make this color scheme your own with elegant table settings, bridesmaid dresses, and maybe a pop of pink to really bring out the cheerful hue of turquoise. We all know Pinterest is a bride-to-be’s best friend. (Let’s be honest, the same goes for a pre-bride-to-be—hello, secret wedding boards!) With thousands of beautiful, inspirational images of everything from gowns to flowers to food, we can’t get enough either! One of our favorite pinning pastimes is finding inspiring color suggestions and images, and we know brides agree. So we’re thrilled to be partnering with The Perfect Palette on our Nordstrom Weddings Pinterest boards, to bring you ideas in every shade of the rainbow. The Perfect Palette is THE source of color inspiration for parties, fashion, and of course, weddings. There are 54 shades to choose from on the Search by Color function, and more palette board ideas than we can count. The pairings are fresh and unique, and the color names (“cerulean”, “fig”, “latte”) take us back to our Crayola days. Look for our shared Pinterest boards where we’re always pinning bouquets, table decor, bridesmaid dresses, bridal accessories and shoes…really, we’re as addicted as you are! We grouped colors in these categories so you can get mix-and-match inspiration. Follow us and tell us what you like in your comments and repins! We also have a NEW Shop by Color function for bridesmaid dresses on our site. Check it out! Saukok Tiampo, guest contributor of REVEL, has us dreaming of spring with this lovely palette. Our latest wedding look is inspired by an updated country affair, in peach and dusty blue. Pretty shades of peach with touches of lace make for a soft look that evokes spring, while the dusty blues add a bit of elegant contrast (this is no honky-tonk!) 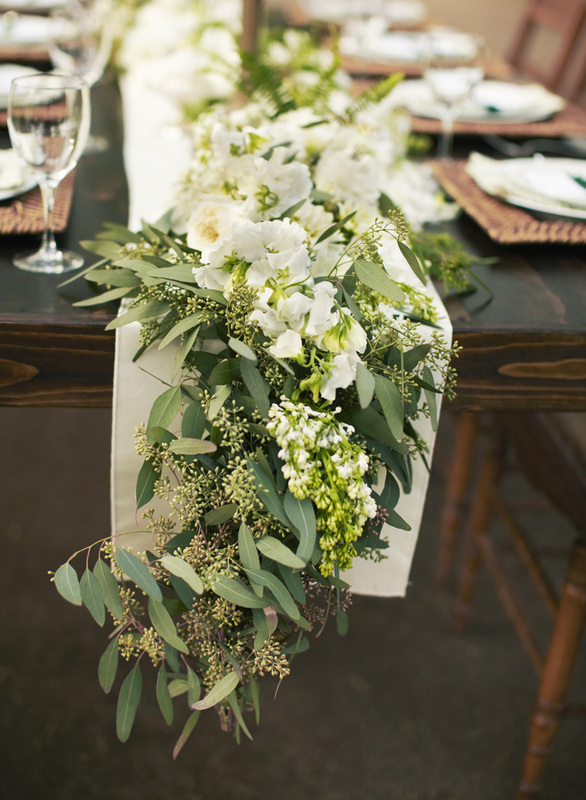 The addition of some woodsy neutrals gives it a rustic feel, ideal for an outdoor spring/summer celebration! Visit me at REVEL for all the details on this dusty blue and peach wedding inspiration, or to check out our wedding inspiration by color and style! Did he pop the question? Submit your wedding colors/your inspiration, and you may just see us build you a board in REVEL by Request! Check out the sweet navy-and-sorbet color combos happening over at REVEL–featuring the delicious ‘Tyler’ silk taffeta gown from La Fleur by Anne Barge (available for special order in our Wedding Suites). Head to REVEL to find out where to get all the other tempting treats pictured, and browse our Fall 2012 Bridal Lookbook for more of our favorite bridal gowns.